City living has its many perks. There’s the small living quarters, the confusing and unnatural odors that appear out of nowhere, and of course the unlimited amount of ways to spend the pocket change left over after your rent is paid. Despite all these glorious offerings, grilling is often not an option for urban dwellers and a world without smoky mesquite flavors or perfectly charred ribs is a sad one indeed. So what’s the solution for steak cravers without the space for a grill or the funds for a sit-down dinner at Peter Lugers? Well with a quality, American Made cast-iron skillet, fantastically prepared filets, rib-eyes and New York strips are just around the corner. 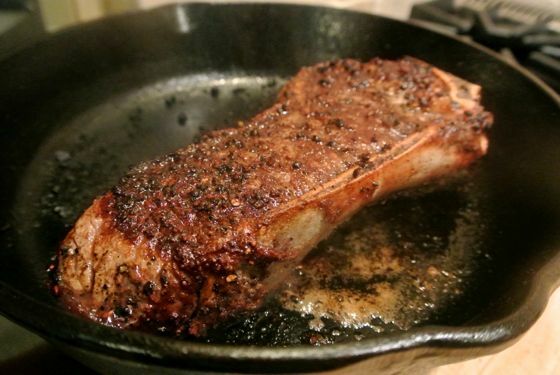 I recently purchased Lodge’s 10.5” square cast iron grill pan and could not be happier to have home-cooked steaks back in my life. The pan is ready to use upon purchase and comes pre-seasoned straight from Lodge’s family owned foundry in South Pittsburg, Tennessee. It’s safe to use on all cooking surfaces from gas and electric stoves to campfires and grills (editors note: do not start a fire or light grills in your apartment). Check out the Official Lodge Website for a full-line of their products, company history, eco-responsibility initiatives and care instructions. IMPORTANT: To scale production, Lodge recently began importing their line of Enameled Cast Iron cookware so read carefully when purchasing.